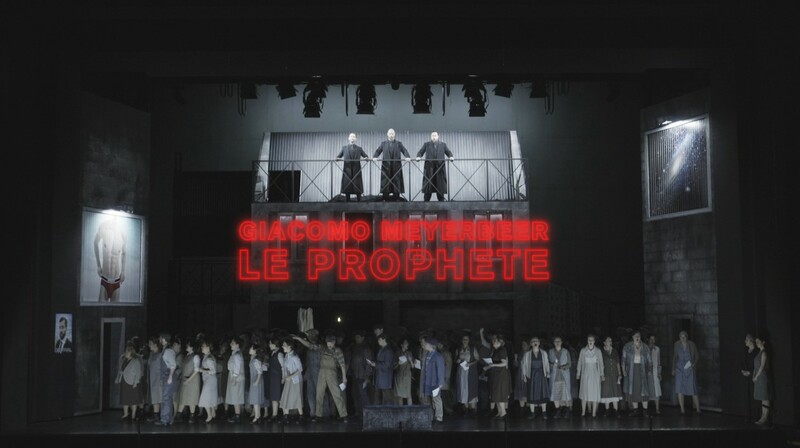 The Deutsche Oper, Berlin's production of Giacomo Meyerbeer's Le prophète, directed by Olivier Py, was new in November 2017 [see Tony's review]. For a pair of performances in January 2018, the opera is being given with a substantially new cast. We caught the first of these, on Thursday 4 January 2018, with Bruce Sledge as Jean, Ronnita Miller as Fidès, Nicole Haslett as Berthe, Thomas Lehman as Mathisen and Andrew Finden as Oberthal. Returning to their roles were Derek Welton as Zacharie, and Andrew Dickinson as Jonas, and Enrique Mazzola conducted. The circumstances of the performance on 4 January were more dramatic than intended. Significant water ingress had badly damaged stage machinery, and the opera was given in a stream-lined staging. Pierre-André Weltz's sets were simplified and the whole staging re-thought. Thanks to, I presume, much last minute work the whole had a remarkable coherence, perhaps akin to seeing one of Glyndebourne on Tour's revised versions of the main stage operas. Premiered in 1849 at the Paris Opera, Le prophète was hugely influential in the 19th century but fell out of favour in the 20th century, in part due to Meyerbeer's relatively conservative idiom but also thanks to the demands of the Paris Opera's stagings of the period. What is remarkable is how, within the tropes of French Grand Opera with the need for a ballet, a grand historical subject, complex large-scale ensemble scenes incorporating a chorus, not to mention a contrasting pair of heroines, Meyerbeer and his librettists Eugène Scribe and Emile Deschamps treated such a complex and contemporary subject. Viewed through the historic lense of the Anabaptist uprising in Munster in the 16th century, the opera examines how revolutions can be fallible and just as objectionable as those regimes that they superceded, and how leaders can be deluded. Olivier Py's production gave us a generic modern setting, both the henchmen of the evil Count Oberthal (Andrew Finden) and the Anabaptists were seen in black. The main weakness being that we had no background for who these people were, and a stronger cultural demographic would have helped. In the opening acts the three Anabaptists, Zacharie, Jonas and Mathisen (Derek Welton, Andrew Dickinson and Thomas Lehman) created a wonderfully creepy atmosphere, building on the way Meyerbeer makes them pop up repeatedly sing their chant, 'Ad nos as salutarem' (which bore some resemblance to Stanford's La belle dame sans merci!). But we learned that this was just a sales pitch, in Act Three Derek Welton's Zacharie had a brilliant solo listing the benefits of their rebellion and the trio with Derek Welton, Andrew Dickinson's Jonas and Andrew Finden's Oberthal (captured in disguise) was positively comic. Olivier Py's production built on this, during Jean's coronation his apparent healing of the sick was revealed as staged by the discreet payments handed out to the participants by the Anabaptists. Ultimately they turned on their supporters, joining forces with Oberthal, the profits were better. Central to the opera in many ways was Jean, a naive figure who was set up by the Anabaptists, but came to believe the hype. There was an arioso during the coronation scene when we came to understand that Jean really does believe he is the prophet. It was his important encounter with this mother, the towering Ronnita Miller, in Act Five which turned him back to realising the truth. Jean is one of those awkward 19th century French roles which require stamina and dramatic heft, combined with significant flexibility. Bruce Sledge, moving from tenor roles in Rossini towards more dramatic repertoire was well placed. There was a sense of him taking care with his resources, understandably as this was his role debut, so parts of Act Three lacked the necessary fierceness, but at the end of that act when he led the Anabaptists in a complex hymn he really rose to the occasion, and his climactic scenes in the subsequent acts built on this. Throughout Sledge sang with an elegant sense of line and focus which, combined with flexibility, brought out the role's essence. He also explored a variety of vocal deliveries using the sort of voix mixte in high soft singing which was an essential part of a French 19th century tenor's armoury but is less used nowadays. The whole had an elegance to it, bringing out Jean's naivety. This was a slow burn performance which climaxed in the right places. Sledge's duet with Ronnita Miller's Fidès in Act Five was not just a dramatic highlight but a musical one. Throughout the opera, Miller gave a performance of startling intensity. This is also a tricky role with a wide tessitura; Miller capitalised on her fine lower register but did not shy away from the high notes, and she can certainly make her voice mobile. Miller has a big, rich voice, she only had to open her mouth and you felt for her as a mother. To hear her and Sledge singing the final section of their duet together was simply thrilling. In Miller's solo aria in that act, her performance was so astoundingly intense that we hardly needed the addition of dancers. As Berthe, Nicole Haslett successfully transformed from simpering coloratura fiancee to revolutionary out for revenge (she thinks the prophet has killed Jean, not realising they are one and the same). Haslett gave us bags of lovely coloratura charm, but there was fierceness too at the end. The role of Oberthal is rather underwritten, yet Andrew Finden glowered wonderfully and was suitably malevolent. Olivier Py's production had the virtue of taking the opera seriously. He added a dancer as an angel who seemed to accompany Jean, to mysterious effect. At other times, I wondered whether there was an attempt to put too much on the stage. I doubt the wisdom of including the ballet, it is little more than a divertissement (skating farmers) and the music will not bear the dramatic weight Py's wanted to place on it. The work's closing scene is analagous to that in Saint-Saens' Samson et Dalila (written 20 years later than Meyerbeer's opera). The use of naked dancers added engaging verisimilitude, but was somewhat distracting from the musical performances. But overall Py gave Meyerbeer and his collaborators the credit for knowing their craft and he trusted the work's dramaturgy, using modern tropes to explore the work's themes, and give us real sense of Jean's journey towards martyrdom. In the pit Enrique Mazzola marshalled his huge forces with efficiency and style. One of the features of this genre is the large scale ensemble. The coronation scene in Act Four includes off stage brass, large chorus and a children's chorus in addition to the soloists. Mazzola but each act to its conclusion, enabling us to feel the real excitement of this music. So what is Meyerbeer's music like? It is worth bearing in mind that Meyerbeer was a year older than Rossini (he was born in 1791). The opera is constructed using standard double arias, ensembles and recitatives. Offenbach's La Grande Duchesse de Gerolstein satirises a scene from Meyerbeer's Les Huguenots, and musically the two are not too far apart, Meyerbeer seems to occupy a territory adjacent to Gounod and Offenbach's larger scale operas. It is not a style much in vogue at the moment, and it is a testament to the Deutsche Oper, Berlin's commitment to Berlin-born Meyerbeer that having performed Les Huguenots and Vasco da Gama (modern new edition of L'Africaine), they presented Le prophète, perhaps Meyerbeer's most serious work, with not one but two highly creditable casts. Whether we will ever see Le prophète in the UK is a moot point. Covent Garden failed in its attempt to perform Meyerbeer's Robert le diable and there seems little chance of other companies taking on this large scale beast, but we can hope. The Deutsche Oper, Berlin performances were based on the new critical edition of the opera. What we need now is a good modern recording of this.